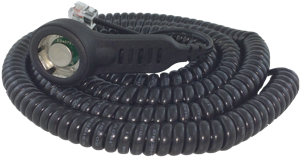 • Coiled cable for connecting iButtons to 1-Wire networks (20 ft when fully extended). • For momentary (F3/F5 MicroCan) or dwelled contact (F5 MicroCan only). The DS1402-RPL+ is a part of the DS1402 series. It is a 1-Wire network cable designed to connect any serial or USB 1-Wire port adapter with a RJ11 jack to an iButton. The DS1402-RPL+ probe cable can touch any iButton for reading, but can only retain the F5 version iButtons. The DS1402 series incorporates four basic types of connectors, 1-Wire RJ-11, iButton, Touch-and-Hold Probe, and Blue Dot™ Receptor. The DS1402 series of 1-Wire network cables provides connectivity for iButtons. The cables are designed to connect any USB, serial, or parallel port 1-Wire adapter to any iButton. Both, the iButton probe cables and the Blue Dot receptor cables can touch any iButton, but can only hold the F5 version iButtons. The DS1402BR8 is the only cable that connects to the DS1401 iButton Holder. Applications of the DS1402-series 1-Wire network cables range from software protection and access control to asset management and thermal monitoring through handheld computers.